Christ Flying out of the Tomb! In the late medieval period, early Renaissance, the popular image of the Resurrection in Western Europe was that of Jesus stepping out of the tomb triumphantly. After all, He was coming out of the tomb! Isn’t that exciting? 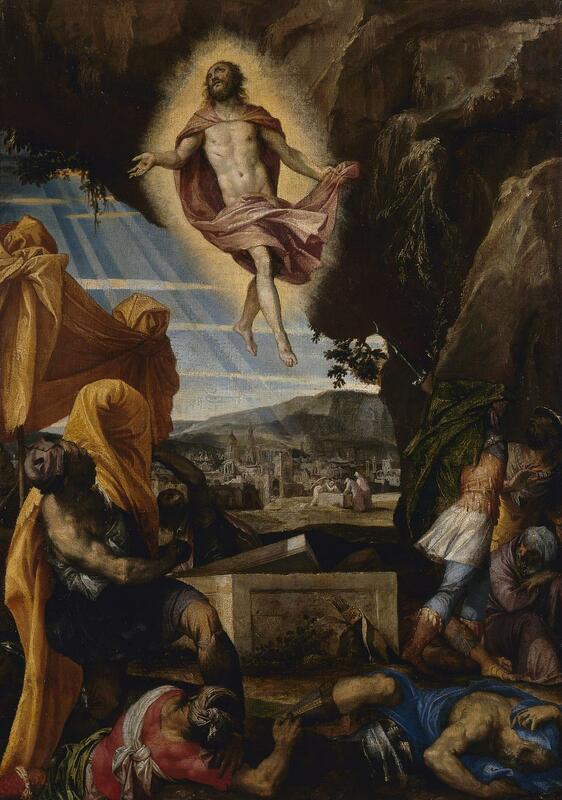 Resurrection of Christ, by Paolo Veronese, c. 1570s. State Hermitage Museum, St. Petersburg, Russia. Shown around the tomb (which is placed inside a cave) are the guards, who are shocked and hiding away from the magnificent appearance of Christ. And, there Christ is, hovering over the tomb, bathed in heavenly light! In the background, look closely: there’s a ray of heavenly light, which leads you to the two women discovering the empty tomb while an angel looks on and tells them that Christ is not there. And there, a cityscape shows Jerusalem in the background. So, why is Christ floating? Well! In the later Renaissance, there was a resurgence of classical mythology was being portrayed in artwork. So, images of Greek gods doing exciting things, such as flying and whatnot, became very popular. If you compared those images to the religious artwork of the day, the appearance of Christ merely stepping out of the tomb didn’t seem very exciting at all. Which made the artists of the day imagine and recreate the gospel scenes in an even more dramatic fashion that made the Greek mythology pictures look less glorious! Mind you! We have no eye witness accounts of the Resurrection, so who knows? Maybe Christ did come flying in! Or maybe Christ merely stepped out of the tomb. We have no idea — that’s why Eastern Europe preferred not to show this scene in their artworks, preferring to instead portray the Harrowing of Hell for their Resurrection icons. In any case, I must admit: I do like the images of the flying Christ. After all, why not make Christ as glorious as you can imagine? Because, in all likelihood, heaven will be even more glorious than that!